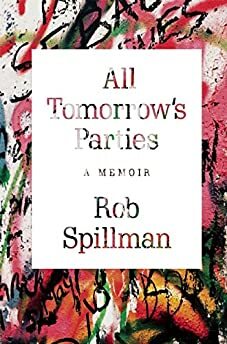 Largehearted Boy: Book Notes - Rob Spillman "All Tomorrow's Parties"
Book Notes - Rob Spillman "All Tomorrow's Parties"
Rob Spillman's All Tomorrow's Parties is an engrossing memoir of self-discovery through the arts that spans two continents. "Musically and culturally astute, this well-structured book is a delightful coming-of-age story couched within a travel narrative that deftly evokes one of the major historical moments of the 20th century. A richly detailed and always engaging memoir on artistic discovery." The heaviest of heavy rotations. I've seen the Japanese hippy noise band several times, and every single performance they play "Pink Lady Lemonade." Sometimes it lasts seventeen minutes, sometimes forty-five. The mesmerizing, lilting opening refrain is the gateway drug, a tear in the cosmic fragment leading to an infinite number of sonic wonderlands, and each trip is different, much like the writing experience. The 80s British noise band call for revolution is bracing, relentless. The Seattle band's cover of Spacemen 3 turns the revolution inward, substituting the overthrow of the government with a morphine suppository. Top 10 album title. The entire album is more in line with Mudhoney's interiority, but with a snarl. With headphones, you can approximate what it was like seeing them on June 19, 1992, at the Ritz (with two-drummer-era Pavement opening for them). Simon Reynolds called it "beautiful music through a dirty needle." The assault was total. Each bass drum kick concussed my Adam's apple. When they returned to New York in 2008, MBV tested their new equipment and it registered 145 decibels. The last entry for "Loudest Rock Band" in the Guinness Book of World Records was for the Who at 126 decibels, before Guinness abandoned the category for fear of encouraging permanent hearing loss. A jet engine at 50 feet measures 130 decibels. In 2008, when I saw MBV, the wall of noise cut right through me. All around people were doubled over in pain, holding their hands over their ears which already had earplugs in them (they were mandatory, handed out at the door). When the band went into their loop at the end of "You Made Me Realize" (which could last 20 to 45 minutes depending on the mood), many people moved back toward the exits. I was pulled forward. A relentless and strange album by the Japanese noise band. Another band I've seen live many times. Wata, the lead guitarist, who may weigh a hundred pounds and looks like she could pass as a Tokyo banker, calmly brings forth the wrath from god knows where. A twenty-minute German hippy drum freakout that, when looped, makes whole writing afternoons blur by. Aggro-hedonism. In 2000, when the Scottish drug fiends were touring for the album XTRMNTR, Kevin Shields from MBV joined them on guitar, creating a driving, disorienting wall of sound. A beer on May 28 at the Hammerstein Ballroom while surrounded by Scots on Ecstasy, all in sync with Primal Scream, that was the last drink I ever had.